Resveratrol is an active agent of vegetal origin, found in red grape-skin, therefore in many brands of red wine and in knotweed (Polygonum cuspidatum). Forte contains twice as much Resveratrol as Resveratrol capsules. Resveratrol is a polyphenol with very strong antioxidant power. The capsules contain it in a very high purity (95-98%), due to the applied extraction technology. As it has got a strong antioxidant power, it contributes to the inhibition of harmful oxidative processes, including inhibition of cellular ageing, besides having a positive effect on carbon hydrate – lipid metabolism as well. It has been demonstrated by clinical studies and national health care data that resveratrol and bioflavonoids have got favourable effects on the circulatory system and on cancer prevention. 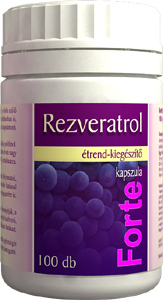 We recommend it to people who wish to support their heart and circulatory system by consuming resveratrol ordinarily.